Pics of Park last week at a photo shoot for A’PIEU. Some early pics for Park's Compagna Spring/Summer campaign. More new Park pics for Compagna's Spring/Summer campaign. Few more new Park pics for Compagna's Spring/Summer campaign, looks really good in these. Park looking simply dazzling at last night's " Psychometry" VIP Premiere. Park looking last week at a photo shoot for CFS. Some oldies here, Park from Compagna's 2011 Summer Catalog. Some fine looking Park promo pics for Jinro Soju. Behind the scenes shots of Park's photo shoot for the Compagna Spring Catalog. 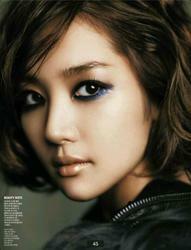 Park from the Jan. 2012 issue of Singles. I am very like city hunter drama. Park really looking Friday at a fan event for A’PIEU. Short preview for Park's upcoming movie ICU, she's looking really fantastic in it. Even more Park pics from Compagna's Summer catalog, looking .